Defense architecture frameworks like DoDAF, MoDAF or NAF (UPDM) are widely accepted standards, not only in defense-related organizations. Because of different frameworks and vendor-specific implementations of the modeling language, interoperability isn´t always achieved easily and information exchange is hardly possible between organizations and partners.The US Department of Defense Architecture Framework (DoDAF) provides the structure for a specific stakeholder concern through different viewpoints. Based on DoDAF other frameworks have been derived such as the NATO Architecture Framework (NAF) and UK Ministry of Defense Architecture Framework (MoDAF). The UPDM (Unified Profile for DoDAF and MODAF) is an initiative of the Object Management Group (OMG) to standardize the UML and SysML usage for these defense architecture frameworks. Although the meta-models and views are standardized, the tool vendors need to map those meta-models into their own tool-specific modeling languages. 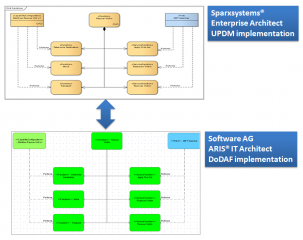 In Sparx® Enterprise Architect the standards are followed closely (it is a leading UML modeling tool…). Software AG, for instance, maps the DoDAF/NAF framework into their ARIS® modeling language. 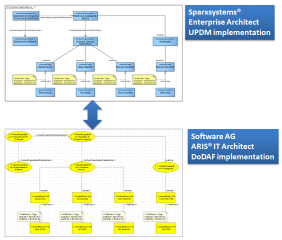 Mapping between the UPDM OV-4 viewpoint and the ARIS® DoDAF implementation of an org chart. Mapping between the UPDM SV-4 functionality description and ARIS DoDAF 2.0 function tree. These examples show nicely how injective mapping rules can be used to map viewpoints describing the same context of information in quite different modeling language implementations found in different architecture tools.